A daily dose of purple potatoes served plain may help your heart. That is, if you steer clear of the deep fryer and fatty toppings. “The potato, more than perhaps any other vegetable, has an undeserved bad reputation that has led many health-conscious people to ban them from their diet,” Vinson says. Another thread was talking about a purple sweet potato. http://www.natmedtalk.com/showthread.php?t=23952 I wonder if this is the same thing. The article related it to the red and white potatoes, so I'm guessing not. I think they mean purple fleshed varieties. Looks like someone is growing them. Not sure where to get the seed potatoes though. I think you'd have to microwave them or steam them as the colour will probably leach out into the cooking liquor otherwise. Maybe they would have the same Blood pressure lowering potential as beetroot? We always get gold (Yukon) potatoes, but we've been seeing those purple potatoes on cooking shows and want to give them a try. Thanks Jfh, didn't know of the health benefits. 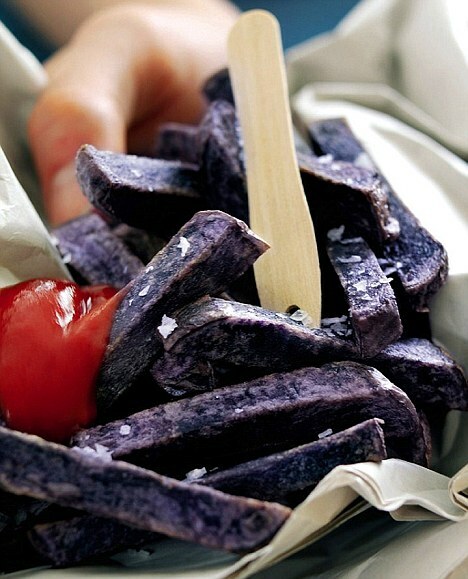 The skin of the purple potato in the picture shown here isn't all that purple. Well, maybe it is It IS darker. I have read before that potatoes really do lower the blood pressure. Do you think that any kind of potatoes can do this?